What is it about winter that makes us want to purge and organize? Is it just me? When all the holiday decorations are put away and the house returns to normal, I always get a little antsy about my surroundings. I spend October through December feathering my nest: decorating for holidays, honoring traditions, remembering the provenance of the trinkets and treasures that make this time of year special. And in January? My thoughts turn to eradicating clutter, getting organized, and setting the stage for the pursuit of the holy grail: productivity. Since this urge to get organized seems to be somewhat universal (and I base this on the deluge of marketing for containers, shelves, office supplies, and professional organizers), I’m sharing a few basic tips for getting your studio in order. There are times when you need to assess your space, figure out if it’s working for you, and fix the things that are barriers to productivity. Why are you organizing your space and your stuff? Does it need do be done or are you putting off a different task? I admit that I sometimes use cleaning and organizing as avoidance tactics. If you are procrastinating, stop reading this and get back to work! No? Okay. Read on. I use my studio for writing tasks, consulting tasks, teaching prep tasks, and (Notice what’s listed last?) making art. Try this: make a list of the things you do in your studio. Now reorder them by priority, making the first item the task you spend the most time on. How well organized are you for that first task? Do you have to move other things out of the way to make room for that activity? Now work your way down the list and see if your studio is a productivity tool or a roadblock. Organizing can be really intimidating. Scary, even. I believe getting started is the hardest part. So, start small. Is there one drawer, one shelf, one section of a table that makes you crazy? Seriously, choose just one. For me, it was a drawer that had so much stuff in it that I couldn’t find anything. Start with one small task that you can complete. One drawer. One shelf. Empty it, throw away things that are beyond usefulness, fill a bin or bag with things you want to donate, and then refill the drawer or shelf with what’s left. You could stress yourself out trying to decide where these things are going to live permanently, but will that move you forward or will that paralyze you and stop your progress? Tell yourself you can truly reorganize later if you still want to and then celebrate your freshly organized area. Do a little dance. Go ahead; I’ll wait. If you have more than one of something, put it/them into a container. 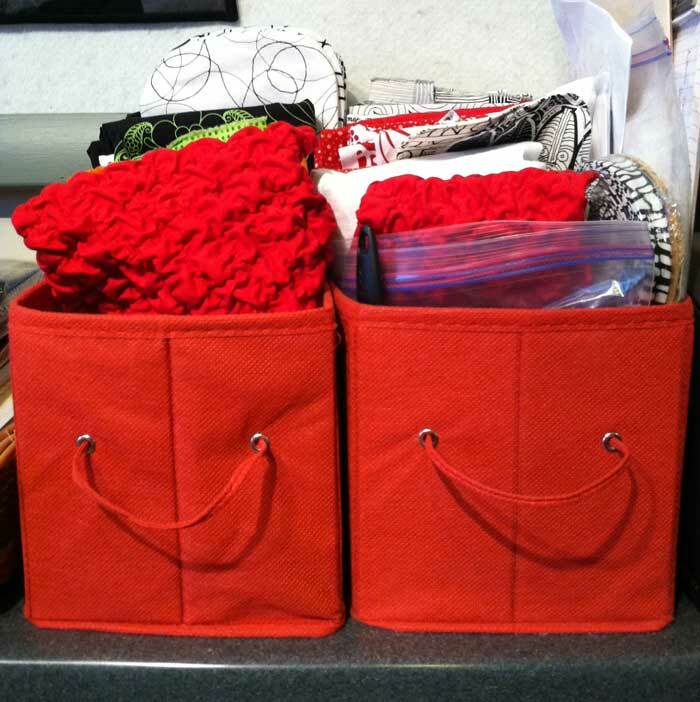 I don’t like to use bags for this because you cannot stack them and they often flop over. Think boxes, trays, bins. I like to keep projects in containers. 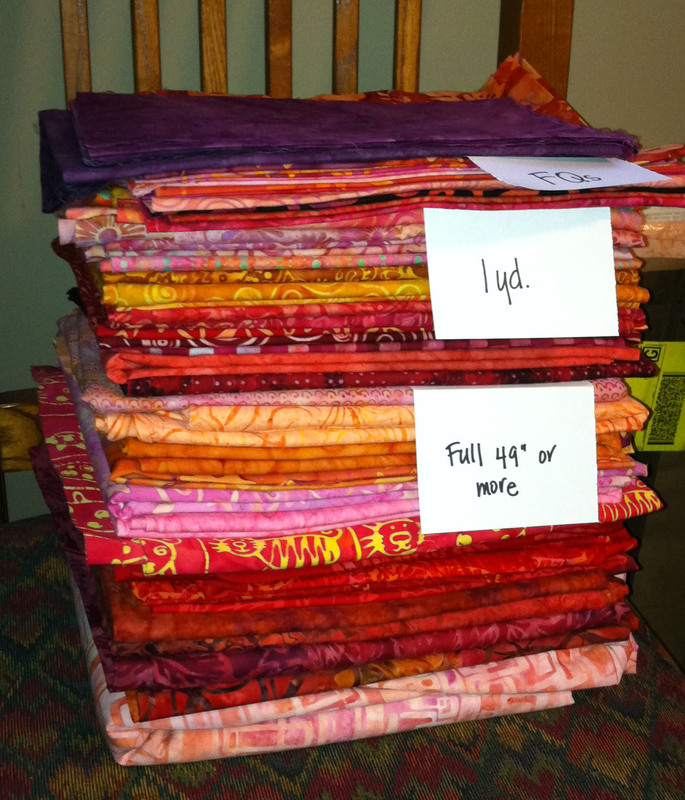 I dump sketches, fabric, thread, anything related to the project into the container. I usually start with a tray and then I upgrade to a bigger box (or boxes) as the project grows. 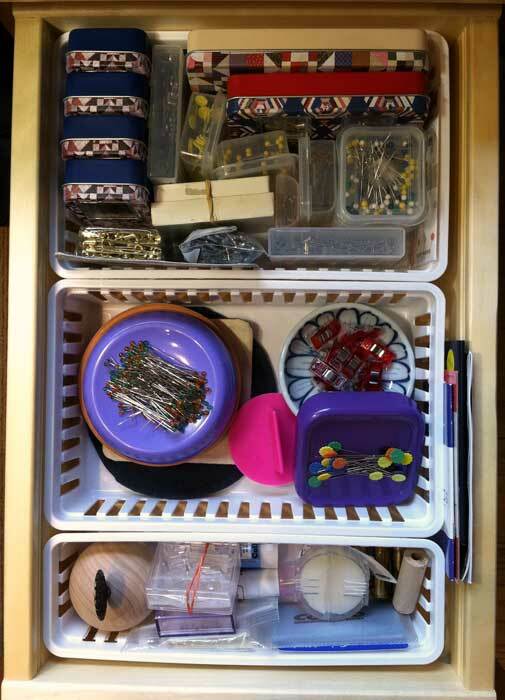 By the way, I’m a big fan of drawer containers and dividers. You can lift them out and take them with you. If you are lucky enough to have the time and resources to reorg your entire studio, do yourself a favor: picture it empty. Now, only put back the things you really want or use. If you need to draw on graph paper and move the furniture around, do it. If you need to physically move things around to see if they work, get strong help and go into it with a game plan. If your reorg plans are more modest, then picture the drawer, shelf, or table top empty. What tasks do you complete nearby? What tools could be conveniently stored there? I had a drawer that I hardly ever opened — translation: the stuff in it was forgotten or was not very important. I emptied the drawer, disposed of the stuff (moved, donated, trashed), and filled the now empty space with electronics that had been living in a basket out in the middle of the studio. The electronics are more convenient and the clutter of the basket is gone. I consider prime real estate to be the space immediately around the command center of your studio. Do you use the things that you can easily reach from your chair? Are those nearby drawers and shelves accessed on a regular basis or is that stuff just taking up valuable space?I sit at a worktable in the middle of the studio for all of my computer work. To print, I had to get up and take my laptop to the printer across the room. The prime real estate next to my work table was filled with stuff I didn’t need to have at my elbow. My printer now lives on a bookshelf next to my worktable. Everything is connected to a universal docking station (Thanks, Hubby! ), and I can print with a few quick keystrokes. Proximity saves time and aggravation. It really is location, location, location. Is your space conducive to work? Do you have a task that you’re putting off because you need to set up or rearrange or get organized before you can actually do the work? Go back to that list of tasks organized by priority and think about how you might set up an area for each activity. For the longest time, I kept my big board (for ironing) upright, leaning against a cabinet. To use it, I had to clear a horizontal space, move the big board, move the iron, you get the idea. 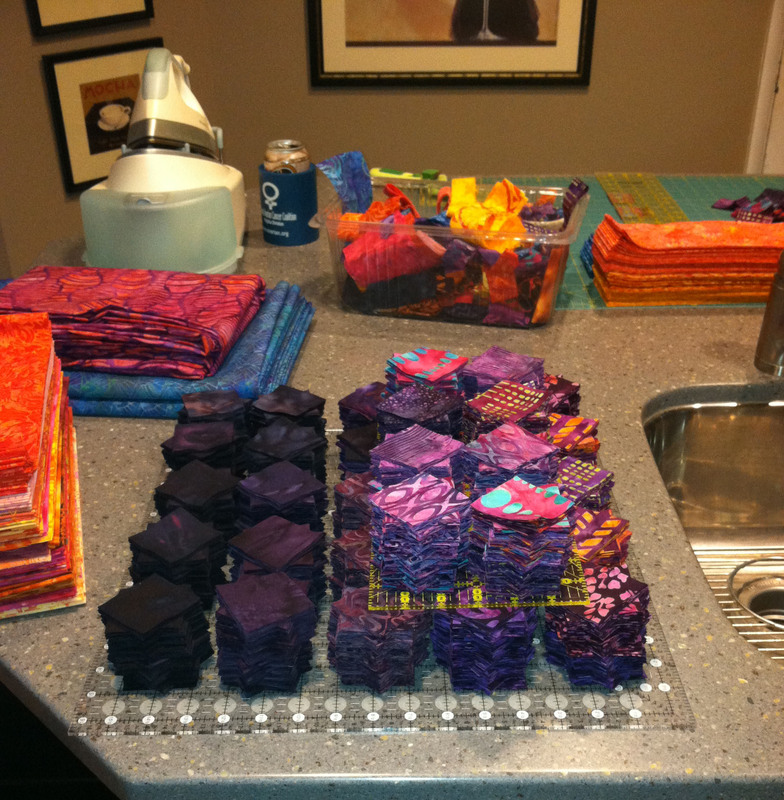 I put off any projects where ironing was involved…which is pretty much all sewing. 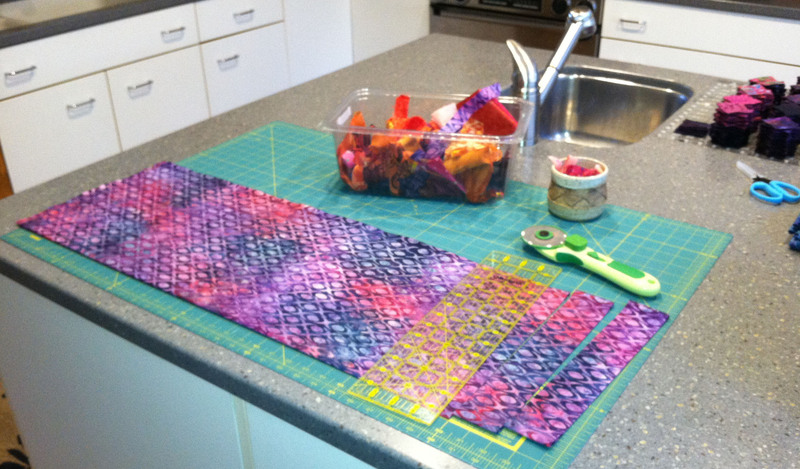 Yesterday I had an “aha moment.” I cleared a counter and put the big board on it, along with the iron. Yes, I still need to find homes for what used to be on the counter, but being ready to work is more important than storing more stuff out in the open. Eventually, most things outlive their usefulness. Thread gets old and weak, fabric goes hopelessly out of style (and your tastes have moved on), books have been replaced by more updated resources, pins become bent, and rotary blades become old and dull. Don’t feel guilty. If something does not work for you, then there’s no room for it in your studio or storage area. Find a home for the things that have to go. 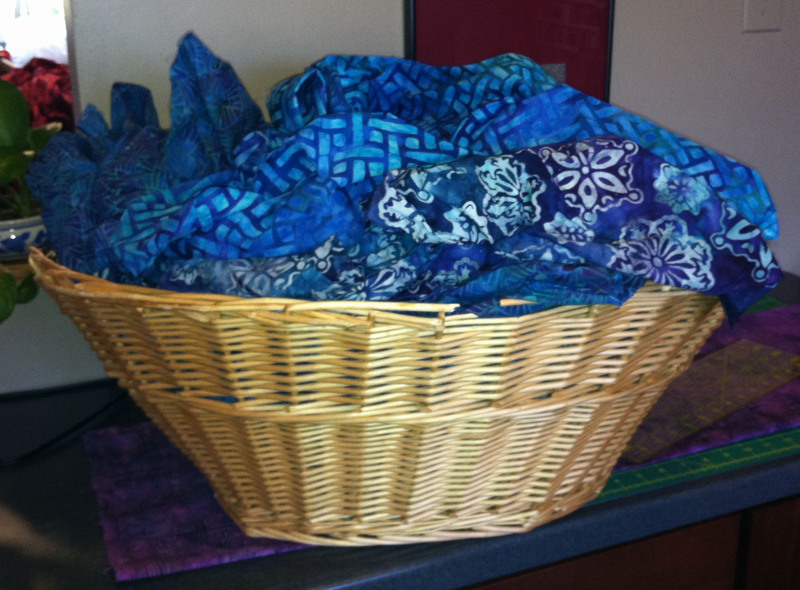 Consider donating useful items to a school, senior citizen organization, quilt guild auction, Freecycle, or a younger quilter who is still in the acquisition phase. If something is no longer useful, then trash it. Really. You have my permission. When my rotary blades get too dull for fabric, I like to save them for paper. Makes, sense, right? Maybe, but how many paper blades do I need? One? Five? Twenty? Discard or donate extras. Many hands make light work. If you’re moving big stuff around, get some muscle to help you. If you need motivation or if you just need some positive reinforcement, call a friend. Don’t try to do this in isolation unless that’s how you work best. If you absolutely cannot do the work on your own, hire a teen who needs some pocket money. If the job seems overwhelming, call a professional organizer. I think it’s worth the money. 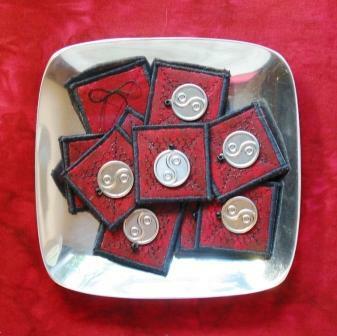 I know some quilters and artists who say they need to see everything, that it stimulates them. I used to be one of those people, but I’ve refined my position. I need to see the things that are related in some way to the projects I’m working on. I like having some images on my vision board. I like color and texture and tiny bits of art, but too much is distracting to me. Figure out what your personal limits are and then respect them. Your studio should reflect your tastes and your personality. You should look forward to being there and enjoy the time you spend there. 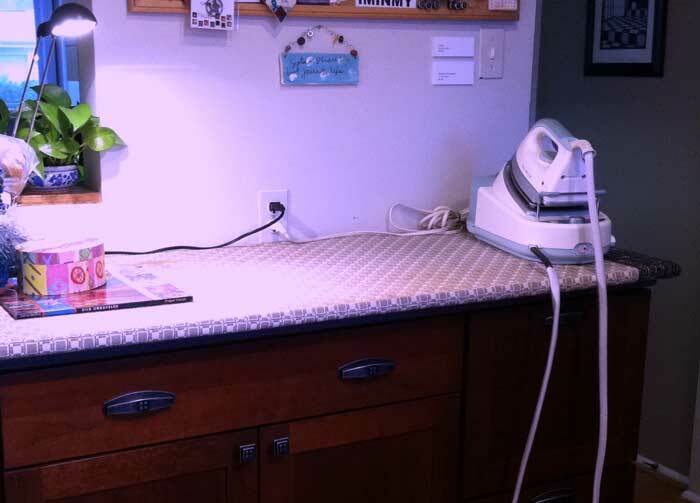 Hang some art, recover your ironing board with some fun (non-bleeding) fabric, put out a cool rug. Make it yours. And then make some stuff. Enjoy!